If you have ever held any doubts about nut milks, or about going to the extra effort to make them at home yourself, then THIS is the nut milk to change your mind. I’m not sure that I can do it justice with words alone, but imagine the most beautifully rich and somewhat decadent milk tinged with a deep, roasted hazelnut flavour and smooth, creamy texture. 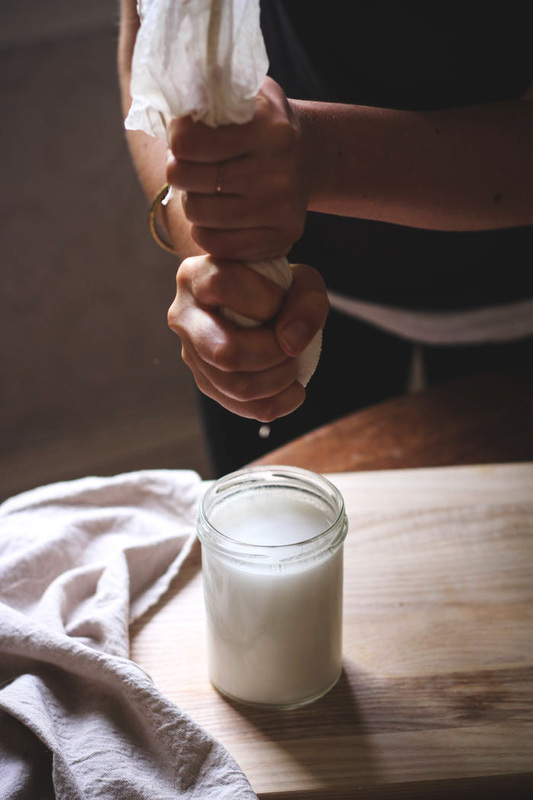 This milk is queen of all homemade nut milks and even though it has a very distinct flavour and colour, I couldn’t imagine it not working anywhere would normally use plain milk. Tea, coffee, porridge, muesli, cakes. Each option gets me excited at the possibility of the how much better that particular drink or dish would be with a little dash of this added in. I picked up some locally grown hazelnuts from the farmers market only to discover that hazelnuts are an absolute nightmare to crack open. Especially when you have a few hundred to get through! With wails of impending RSI, I managed to convince B to help me out, but next time I think I’ll fork out the few extra dollars and buy the pre-cracked version. If you’re a sucker for pain though, you’ll need to slowly work through this step to get you started. I recommend listening to this while you do. It dulls the pain, a little. After you’ve cracked the nuts, you’ll need to roast them. Preheat the oven to 180C || 350F and spread the nuts out on a baking tray. Place in the oven and roast 10 – 15 minutes until they are nice and golden. Watch carefully in the last few minuted to ensure they don’t burn – the line between perfectly-roasted and burnt nuts is quite fine. 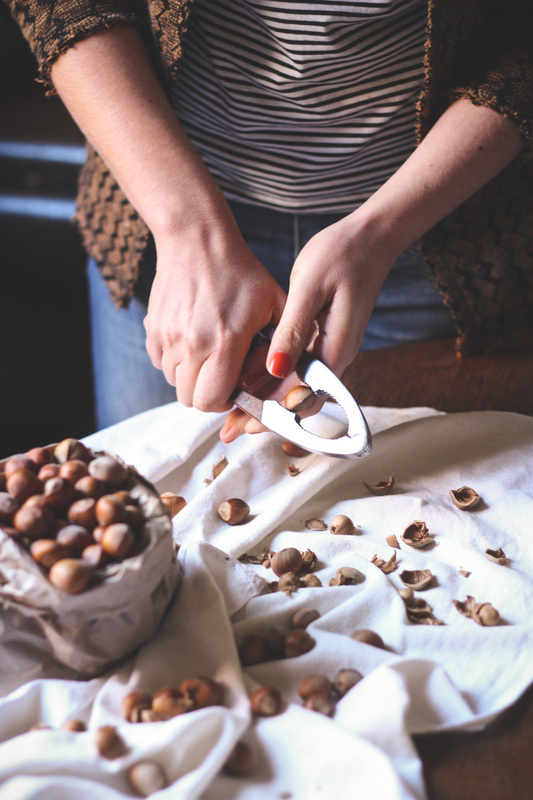 After you’ve roasted the nuts, rub them in a clean teatowel to remove some of the skins. As you can see in the picture below, I wasn’t too fussy here and left some of the more stubborn skins on which did not detract from the taste at all. As with all nut milks, soaking the nuts before you blend will make for a smoother, creamier consistency. You can skip this step if you’re impatient (I know, the lure of roasted hazelnut milk is pretty hard to resist!) but I urge you to leave them to soak at least and hour or to, or longer if possible. I was very well restrained and left these ones overnight. 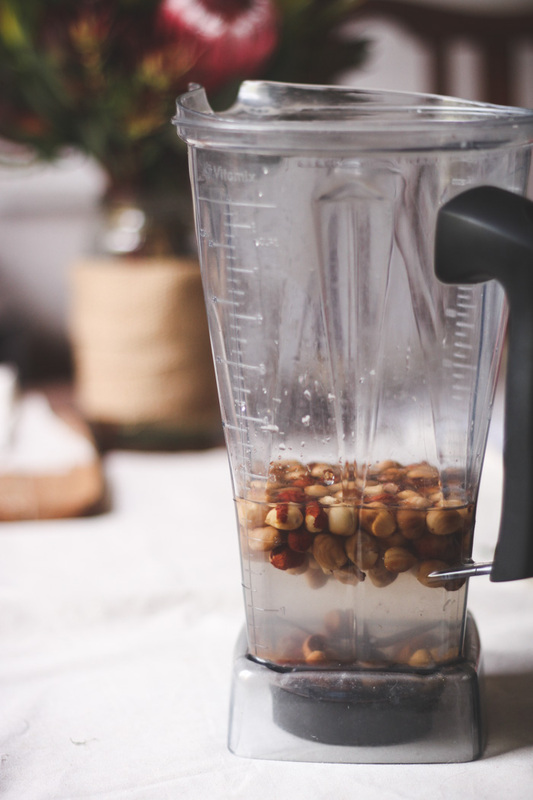 Once the nuts have soaked for a while, strain them and add them back to a high powered blender (such as a Vitamix) with 2 cups fresh water. Blend them for a good minute until thick, creamy, and a lovely creamy caramel-y colour. If you have a not-so-highly powered blender, definitely don’t scrimp on the soaking time which will help you gain a creamier consistency. To strain the nuts, pour the mixture into a nut milk bag, or layered cloth such as cheesecloth or fresh tea towels, and bundle up carefully so as not to spill the mixture out of the top. You can do this in batches if you find it easier to work with. Squeeze out as much liquid as you can into a large jar or container – there should be just shy of two cups of milk here. Remove the nuts from their shells if not done already. Place in a clean tea towel and rub to remove some of the skins. Place the hazelnuts in a jar and cover with water and allow to soak an hour or two, or overnight. Strain and rinse, and then add to a high-powered blender with 2 cups fresh water. Blend until smooth and creamy, around a minute. Strain through a nut bag or cheesecloth until most of the liquid is removed. Store in a jar in the fridge up to five days. 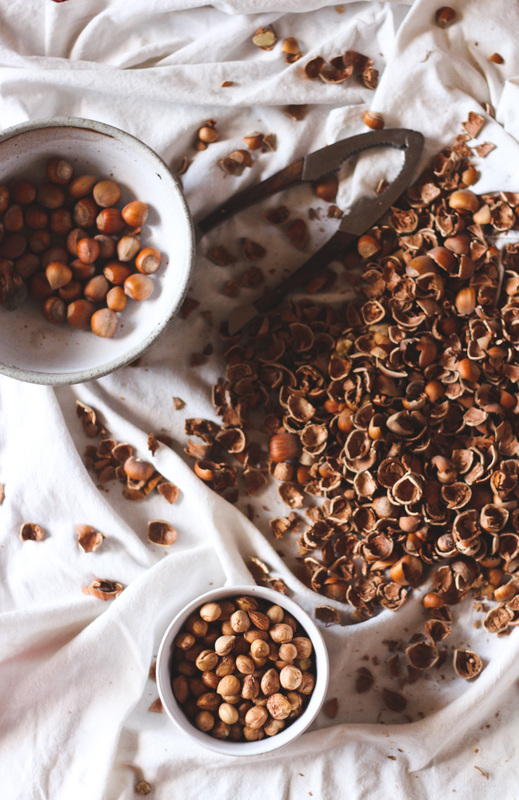 Nothing beats the taste of roasted hazelnuts! 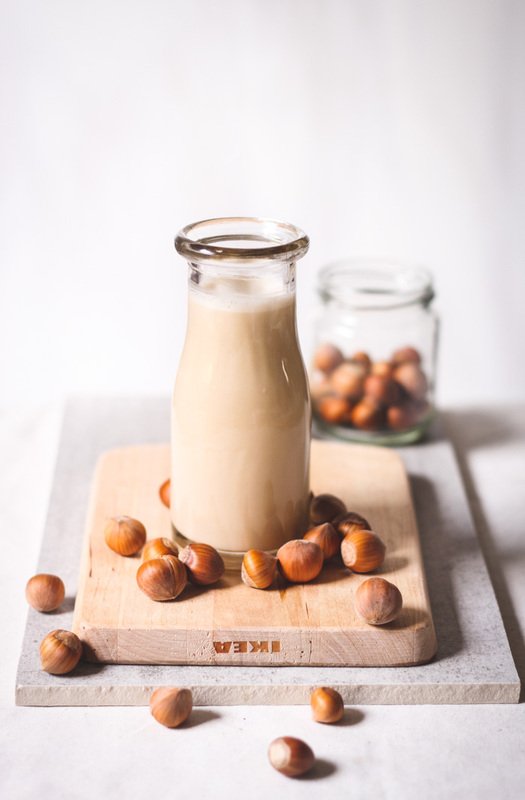 I love that flavour – and it sounds heavenly to make milk from roasted hazelnuts! Definitely making this some time! i think you may have left out the measurement of how much hazelnut to use for the recipe. it looks like 1 cup but that’s not stated – or i missed it (sorry). also, i use the blanching method to remove skins which usually causes the nuts to split in half which means that 1 cup of these is more than 1 cup of un-split nuts and i didn’t adjust the water because i am using it for keto-coffee and want a more concentrated milk. 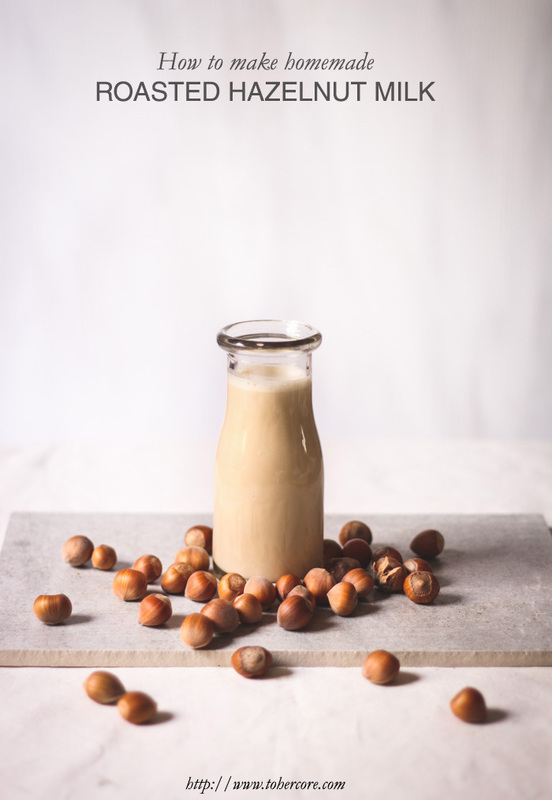 I’m intrigued by a roasted hazelnut milk – I’ve made raw before & loved it. I’m also a little confused. In my experience unshelled means with the shell on, and shelled means without the shell (the process of talking the shells off is called shelling, so it refers to which nuts the action has been performed on). So 1 cup without shells or 3 cups with shells?? I make my own cashew milk quite a lot I usually leave the pulp since I use it on my pearl barley “oatmeal” and I figure it will be more protein. 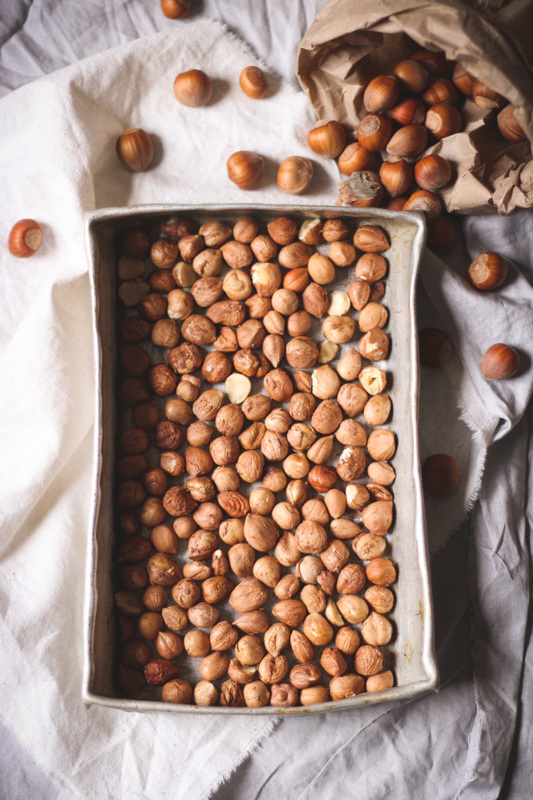 I can’t wait to make this recipe I found a box of already shelled and roasted hazelnuts at my grocery store this morning. I’m making this right now and can’t wait to try it in my coffee! I have quite a bit of nut meat left. What do you do with yours? It seems to good to waste! So tasty! I have been trying to slowly eliminate dairy from my diet but haven’t found a good low-waste substitute for milk in my coffee. This makes my morning coffee and treat! I didn’t have cheesecloth but used an extra fine mesh strainer and it did the trick as well! How did you get your milk to be a Carmel-y colour? Mine was just white. Hey! I can’t wait to try this recipe! However, I think you might want to update the ingredients. It says 3 cups UNSHELLED and 1 cup SHELLED. I was a bit confused at this point haha but I figured it was backwards. Thanks! Thank you for this recipe and the fun presentation. Very helpful and effective.